By the way, the aforementioned tax hikes and make-believe spending cuts are supposed to generate “savings” over 10 years that will “offset” the higher spending that will occur in 2014 and 2015. Needless to say, it’s goes without saying that all the new spending will take place in 2014 and 2015. But I wouldn’t hold my breath for alleged savings that are supposed to take effect in the following years. With American growth trendline now exhibiting serious deficit compared to world GDP growth trendline (because of our adoption of European style effort-reward curves) American GDP as a proportion of total world GDP will inevitably shrink. In that environment, it is delusional to think that we can keep outcompeting the rest of the world in military spending. The military-industrial complex does generate some revenue, but overall it is a net consumer of wealth produced in the private sector, and a net depressant of our aggregate economic growth. Many America haters throughout the world think we sell Iraqi blood at great profit in the Dracula market, but in essence we spend a truckload of money that depresses our economic growth to provide police and open markets services to most of the world, and most of the world hates us for it, to boot. In the end, without the high growth of unadulterated domestic effort-reward curves — that will bring our growth rate at least on par with world growth trendlines — nothing, NOTHING, is sustainable, not even American military supremacy. Our military competence, together with our exceptional wealth will be absorbed into the world average. Speaking of military spending, did you guys see the article in the WSJ yesterday by John Lehman, former Navy Secretary under Reagan? “While the fighting forces have steadily shrunk by more than half since the early 1990’s, the civilian and uniformed bureaucracy has more than doubled”. He says there are more than 1.5 million full-time civilian employees in the military. What in the world do those 1.5 million people do? Anyone claiming we don’t spend enough on our military is not looking at the facts. If the GOP wins the Senate in 2014, look for more spending increases. We’ve got too many Sunday Soldiers in both the House and the Senate for anything else to occur. But there is good news. 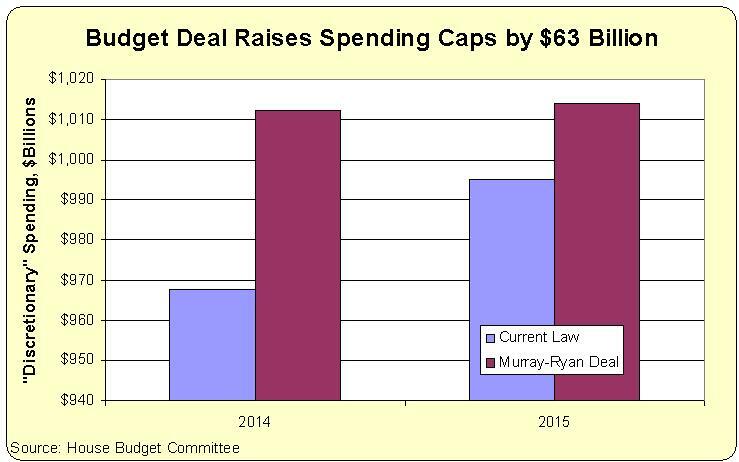 The spending increases will be passed in both houses with bi-partisan support. So the republicans now pretend that they do not want to shrink the government, so that they keep the center, and then once they get elected they will trick the center into accepting a government shrinkage. What does that say about the prevailing values of the American voter majority? Basically the republicans’ tactic is to trick the electorate to vote contrary to their values. So tactical details are largely irrelevant, ephemeral obstacles to voter demand for government expansion. American voters are willing to accept significant government expansion when they can get some expansion in the direction each voter likes. That is the basic dynamic and it is a quantitative not a qualitative dynamic. The same dynamic through which European governments expanded. Once your willingness to accept more government — so long as your pet government handouts get approved — crosses a certain point along a continuum, then your society almost abruptly transitions from a virtuous cycle to a vicious cycle. It’s the American voters stupid! They have started voting like Europeans. A little bit more government finally pushed past the tipping point. It is a long process of interaction between politicians promising, and voter-lemmings buying. It took a while, but the same dynamics that played in Europe will play here. American voters have finally figured out how democracy works. Democracy with a weak constitution to be exact. And since the American constitution is an impediment to people imposing absolute democracy (it does not let the majority feed hemlock to Socrates and does not let them crucify Jesus when they want, it does not let them force a minority disproportionally pay for their healthcare and infrastructure) the unique American constitution of limited democratic government powers is been pushed aside. Europe redux. All this blood and quarreling with Europeans over American independence only to have Americans retroactively change their mind and wanting to imitate Europe. 1. Repubs did not want another shutdown, even if that meant compromising on the sequester. 2. Some repubs did not want the sequester in the first place on defense cuts, and traded with the dems to get more money for defense, in exchange for giving the dems more money for everything else. If repubs take the senate, then reason 1 eases quite a bit, since any future shutdown fight will leave obama all alone vs both the senate and the house, so he will be in a weaker position. And if we also have both the senate and a dem prez in 2016 then reason 1 will be no excuse at all. But reason 2 is a bigger problem, and might only be solved by primarying out the repub defense hawks. I used to support defense when the dems constantly wanted to cut it, but gov is so big now that it is time to cut everything. Now I am prepared to agree to defense cuts, as long as they are not at a much higher proportion than cuts in everything else. I agree in part with DMH. The GOP has an edge now because of the disaster that is Obamacare, and Obama was hoping to change the narrative by forcing a shut down that they could blame on the Republicans. However, there is another reason why some Republicans are supporting this, and that is defense spending. The fiction that we cannot cut defense spending (we spend more on defense than the next 10 countries COMBINED) is driven by Congressmen on both sides wanting to “bring home the bacon,” and their re-election is more important to them than anything else. I think Obama is aware of that, which is why the sequester was structured the way it was, with Obama thinking the GOP would never consent to cutting defense. So we need to pressure those GOP Congressmen to put the country first and their own re-election second. Or we need to find strong primary challengers. Or we need to vote Libertarian. Haley Barbour once said (quoting someone else) that the main thing to remember is that the main thing is the main thing. The main thing for conservatives is to win the Senate in 2014 and the White House in 2016. This budget deal is what compromise looks like. If conservatives don’t like compromise, then they better win at the next election. In order to do that, it is probably a good idea not to alienate the center with another government shutdown. When others stop lending to the US at artificially low rates, including Americans weary of their own debt, then…then the even worse madness will begin. Most of the shortfall will be made up with extra taxes, in a panic, in a new crisis of unfulfilled treasury auctions and thus necessarily runaway rates, in emergency congressional all nighters where drastic taxes will be, temporarily of course, passed (this is perhaps how eternal VAT comes to life in America). All this crammed in panic down the throats of voter-lemmings who instigated all this in the first place. Voter-lemmings will capitulate and acquiesce to the standard narrative used in these situations: “It’s the only choice, once we get some breathing room we’ll have time to make better plans”. But the vicious cycle will intensify and the breathing room will never come. Watch for France to show the path. But it’s already too late, past the point of no return. France’s and Europe’s decline will proceed at a rate the electorate can digest. In a way, the only hope is that American decline will actually NOT be orderly, and that the implosion will be so swift that the American star implodes and then bounces out on itself like a Supernova. While that may ultimately be a better outcome, many, most, will suffer terrible outcomes in this scenario. Politicians and voter-lemmings will do all they can to keep the decline orderly — like in Europe. So that they can buy votes and further their political feel-good careers for as long as possible. To the extent that voter-lemmings buy the self serving (or so they think) redistribution, they are worthy of their fate. Useful idiots will enjoy the victory of imposing their will and bask in the power to have driven the country — even if to decline. I sent your post the other day in email form to over 30 Tea Party Republicans in both the Senate and House the other day!!! Standard government response: Spend more money now, promise to save it in the future. But the future never comes. Very disappointed with Mr Ryan. What happened to Medicare and Social Security reform? Oh well, until folks stop lending to the US at artificially low rates the madness will continue. Europeanization into big government — flattening of effort reward curves — suppression of motivation and convergence towards true average worldwide prosperity , never reverses. It only stalls temporarily and then quickly resumes. Massive new entitlement of ObamaCare. Tax increases. A new pack of compounding centralized regulation from the capital. They all stay, and are here to stay. Minor spending restraint: temporary, gone in less than a year. At a personal and practical level, intelligent people who read this blog should enjoy the few short years of the last great American smorgasbord of HopNChange, steal the last few wallets of the naive HopNChangers (eg. the fed they indirectly put in power is handing you their money hands over fists in exchange for HopNChange , so take it! there are, after all a few ways in which a few people can somewhat profit from decline — just think of politicians — and make the best out of a bad situation where most get systemically screwed) and prepare by securing a life boat. Unfortunately, the country, under ever flattening effort-reward curves, will not be able to generate enough wealth to profit but a few sly individuals who can sell Hop nChange Solyndras to the masses. Those who count on an American turnaround will live through a depressing wretched decline interrupted by a few “hopeful” quarters that keep the Hope alive. Ok, enough philosophizing. Now get dressed, leave your children and your house, drive by the golf course, the fishing house by the lake, the local Tai-chi group, the surfers at the beach, and the bird watching group at the park, and go get holed into your office, join your 50+% marginal tax rate executives and the 99 week unemployment janitors and muster enough enthusiasm at your job to outcompete the three-four billion emerging world souls of this planet who are working, hoping to buy their fist car and house ever. And do pursue your work with all this fervor, when you could, after all abandon it, sign up for ObamaCare and join the bird watching group every morning, the golfers, the tai hi, the surfers, the fishing at the lake. Sure… American top of the world prosperity is here to stay. It won’t be that bad..